The State and Federal Governments are proposing spending $15 billion dollars (more than $3,000 for every man, woman and child in Sydney) extending the M4 and M5. They are doing this based on a business plan that contains no hard numbers on traffic volumes. Simply to pay the interest on that much money would require half a million vehicles a day to use the new tunnels – more than double the patronage of the current M4 and M5 combined. From 2019 and 2023, at least, the M5 extension is to end at Sydney Park – as if the surrounding roads were not already at capacity. No modelling on the impact of the additional traffic has been released. There will be widening of the roads immediately next to the park, at the cost of up to 80 houses and a good chunk of Sydney Park, but not the roads they feed. The government appears to have dismissed public transport out of hand, even though kilometres driven per person are falling, while usage of public transport, cycling and walking are all increasing. There is no information about where the exhaust stacks will be, or whether they will be filtered. We encourage you to write to your local MPs, and to one or all of the State Upper House crossbench MPs who hold the balance of power [Click here for contact details]. We don’t want to encourage form letters. Any letter is better than no letter, but a short letter saying what your personal concerns are is is worth more than a long form letter. Stand up for Sydney! : WestConnex, Planning, Towers, Bay Precinct, CSG, etc. Seaview Community Hall, Seaview Street, Dulwich Hill. The NSW Chief Scientist and Engineer released her much anticipated report in October. The Coal Seam Gas industry says it give it a ‘green light’ for increased CSG production. Activists point to the report’s warning of ‘unintended consequences’. Dr Stuart Khan, from the University of New South Wales, who contributed to the report’s findings on the management and risks associated with produced water from CSG mining, will be the forum’s guest speaker. Dr Khan, who was also an expert reviewer of the final report, will present his perspective and its implications for the CSG industry and affected communities. On Saturday 22nd November, Alexandria Vet is hosting the annual “Glow in the Park” in Alexandria park. Glow in the Park is a charity event that raises money for Fetching Dogs (a dog re-homing charity). 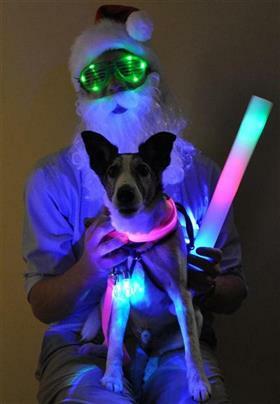 The aim is for owners to bring their dogs and dress them up in glow / lights. There will be glow items for sale for pets (and kids) professional pet-Santa photos by Fuzzy Beast (a pet photography business in Alexandria), a bbq, prizes for best dressed, a raffle and 80s music. It goes from 6.30pm to 9-9.30 pm. Kids and families without a dog are welcome to come along.